Ganesh Bagler is an interdisciplinary researcher with training in physics, computational techniques and computational biology. He has masters degree in physics (Pune University), MTech in computational techniques (University of Hyderabad), and PhD in computational biology (CSIR-Centre for Cellular and Molecular Biology). 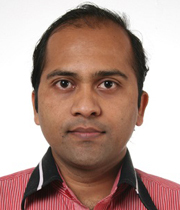 Ganesh received his postdoctoral training from NCBS (Bangalore) and MPI-MG (Berlin). He has been working on biological complex systems modeling, and has investigated protein structures and complex diseases from graph theoretical perspectives. He is credited with the observation of assortative mixing in residue interaction graph models of protein structures as well as discovery of exceptional ‘negative food pairing’ in Indian cuisine. His research involves questions on the interface of biology, medicine and computational sciences.